In this week's article we travel up the holy Ganges River up to near its source in Rishikesh, India. After suffering the sweltering heat in India for over a month now, a rainstorm was the last thing we expected last night. 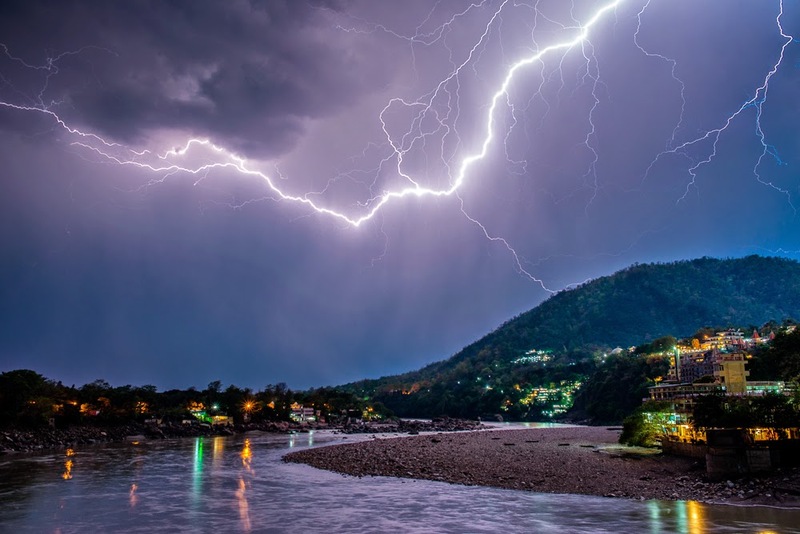 We were blessed with one of nature's most brilliant performances as a rain and lightning storm lit up the Ganges River. I spent the night on the rooftop of our ashram getting the shots in this article. It must've been quite the odd scene as I had only time to grab my camera gear, a raincoat and a towel as I ran up in excitement to the rooftop in just my boxer shorts. Despite the breezy draft up my legs and catching a cold; I had such a blast embracing the thundering storm. 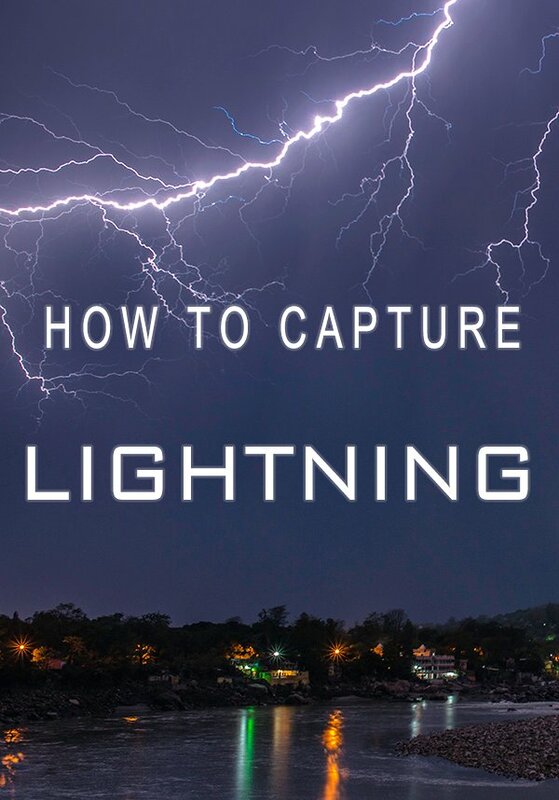 I was inspired by this fun experience to write this tutorial in hopes that you will also enjoy the art of capturing lightning! Wide angle lens: It is best to have a wide view of the sky to catch the lightning action. Tripod: This is essential to keep your camera steady for long exposures. Shutter release cable or remote shutter trigger: This will be a helpful device to minimize camera shake when you take a photo and it also can be used to multiple exposures over time. This piece of equipment is also useful to operate your camera from a distance. Rain protection: This can be a towel, plastic bag or a professional camera cover as long as it protects your camera from getting wet. One of the reasons why photographing lightning is so difficult is because the behavior of lightning is unpredictable. In a controlled studio environment we produce light using a flash. This light produced by a flash is a measurable amount that is consistent so that we can set our exposure and shoot away knowing we will have perfect lighting each time we press the shutter. We can consider lightning to work like a flash; however we never know when it will fire, how intense the light will be and where it will fire. All these characteristics will affect how the photograph will expose so in other words we are shooting in the dark. The key to a successful lightning shot is to set up a sturdy tripod in a safe place with a good viewpoint. Use your common sense when putting your metal tripod in vulnerable places such as an open field. If you wish to put your tripod in a lightning strike prone area make sure you use a remote shutter release and don’t stand near your tripod. Once you have put your tripod in the desired viewpoint make sure to have it secured from movement. Lightning storms are usually accompanied by high wind so I suggest weighting your tripod down with sandbags or by simply attaching your camera bag with a caribiner to the bottom of your tripod. Rain protection is a good idea during a storm. Professional rain covers allow the entire camera to be protected while still giving you access to controls and the view screen. I personally prefer a large towel draped over the camera so I can also use it to wipe the lens when the rain goes sideways. If the rain is really pouring I use my rainjacket. I simply put the hood on top of my camera, let the jacket drape over my tripod and zip it all the way allowing only my lens to be exposed. The stiff hood of my jacket also creates an overhang over the lens. I then thread the shutter release out of the vent and I can trigger the shutter without touching the camera. So the scene is set: you have your tripod secure, your shot composed and you are eager to catch some lightning. 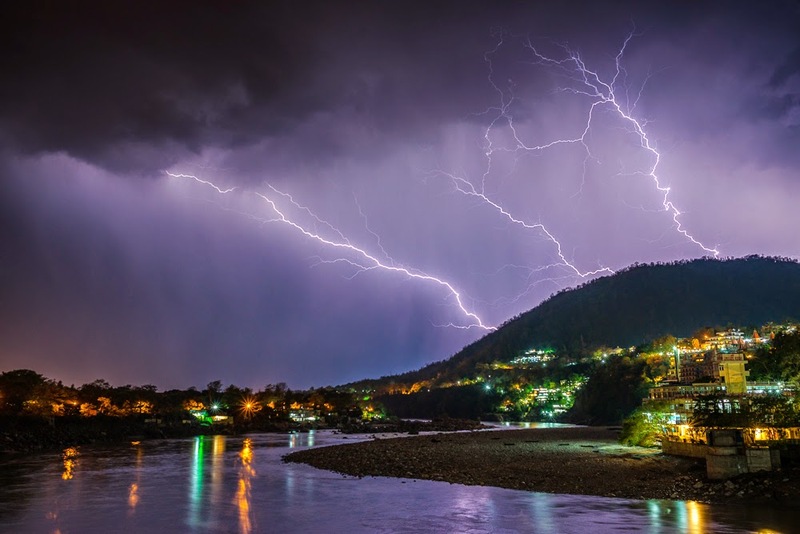 Unlike regular long exposure photography, lightning shots are exposed to the flash of the lightning, not the ambient light of the scene. By exposing for the lightning, your exposure will likely be underexposed if the lightning does not strike while the shutter is open. So how do we expose for something that we cannot meter you ask? Trial, error and experience will help you find the exposure, as there is not a single exposure that will work in every situation. I usually start off with my aperture around F8 so that most things in my scene are in focus. I will open up the aperture if the lightning strikes are not as bright which often is the case when they are further in the distance. I will then set my shutter speed to 10 seconds – 30 seconds depending on the ambient light. We use long exposures because lightning occurs so fast that triggering a shot the instant it occurs is humanly impossible. There are some devices that you can buy that trigger when it senses lightning but I have no experience with them. By leaving the shutter open we are hoping that a lightning bolt or several lightning bolts will occur while the camera is recording information. I prefer not to leave the shutter longer than 30 seconds as it will increase digital noise as well as allow too much ambient light in and make the scene look like daytime. The final adjustment is the ISO. I normally start the ISO around 100 but I will dial it up or down depending on how bright the lightning is and how much ambient light is affecting my scene. The key to getting a successful lightning shot is repetition, dedication and a whole lot of luck. 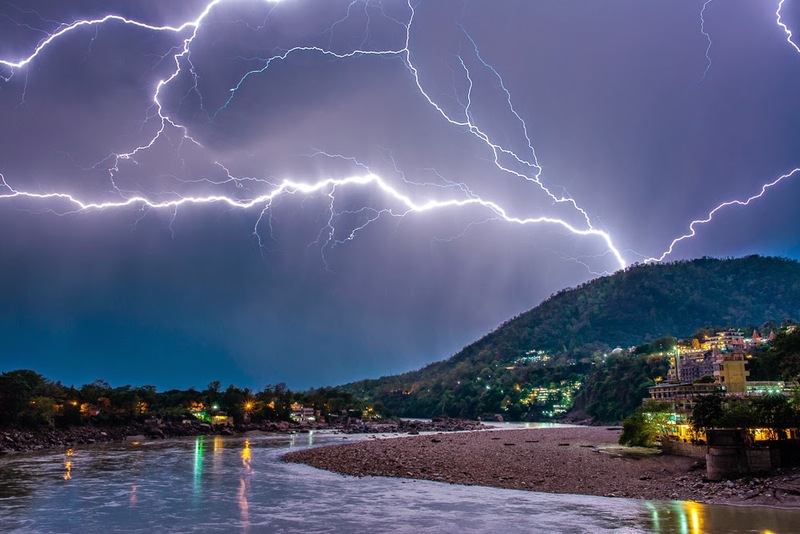 The lightning bolt is unpredictable itself but once you factor in the clouds, rain, light pollution, obstructions etc… It seems like all the stars must align perfectly for the lightning to be visible at all. To increase your chances of getting the perfect moment I let my camera shoot continuously until I feel that it has recorded a shot. There are two ways to do this: You can set the intervalometer built into your camera to shoot continuously for the amount of frames that you program; or you can switch your shooting mode to “continuous shooting mode” then with the shutter release press the shutter and lock into place to keep the shutter depressed. I prefer the latter method as I can quickly release the cable to check my shot and stop the sequence. This method also allows your camera to continue recording while you watch from a safe distance if you are in a vulnerable position. Lightning photography is not an exact science. Often you are at the mercy of nature, so don’t be discouraged if you don’t register any lightning bolts the first session. I have had way more storm shoot sessions than actual successful lightning bolt shots because most of the time the lightning bolt isn’t even visible through the clouds. When a clear bolt does appear, you have to be pointing in the right direction with all the right preparation described in this tutorial to capture it. The advice I can give you is to be patient and keep storm chasing, because somewhere out there is the perfect lightning bolt waiting to be captured by you.